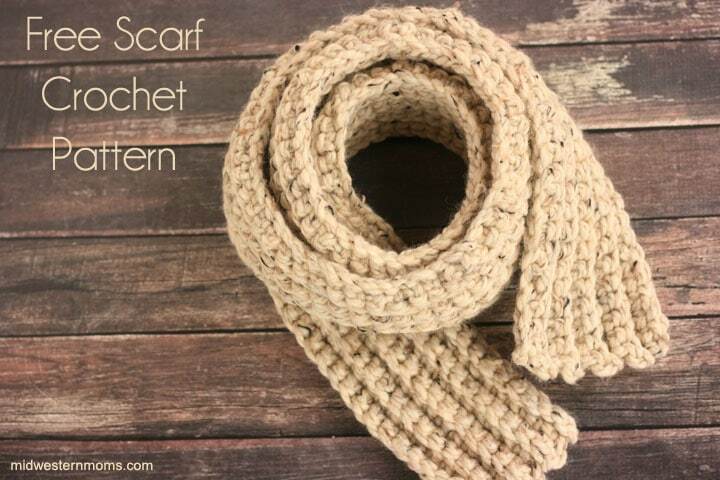 This free scarf crochet pattern is perfect for beginners! Brrrrrrrr! It has really gotten cold out! I was enjoying the semi-warm winter we were having. I was spoiled there for a while. After scraping ice off my vehicle the other day, I decided I needed a nice warm scarf. I also need some gloves, but that project will have to come later since I am still learning how to crochet myself. A few Christmas’ ago, I made a couple of these for my grandmas as gifts. They both love them. Of course, I didn’t write down my pattern so I made sure to write it down this time. I chose to use Lion Brand Wool-Ease Yarn for this scarf. It is bulky and when it is all done, makes for a nice warm scarf. This scarf ended up measuring about 5 feet long and 4 inches wide. You may keep this in mind when you are crocheting your own scarf. You may need to adjust the stitch amount to get the same size. I stand about 5 feet 3 inches tall, so if you are a little bit taller, you may want a longer and wider scarf. Once you have made the beginning chain, check to see how it fits you. I worked into the back loops of the stitches to create a ribbed look. I thought it gave it a nice texture. Make sure you check out these free crochet patterns! Row 1: Chain 133. Single Crochet back to your beginning chain. Turn your work and Chain 1. Row 2-8: Single Crochet into the Back Loops across your work. Turn your work and Chain 1. Row 9: Single Crochet into the Back Loops across your work. Cut your yarn and use your crochet hook to weave in your ends. I didn’t put an edging around this crochet scarf. I thought it looked good without one but you are free to add an edging. The ones I made for gifts, I did put a single crochet edging around the scarves. Make sure to visit my crochet section to find more free crochet patterns. 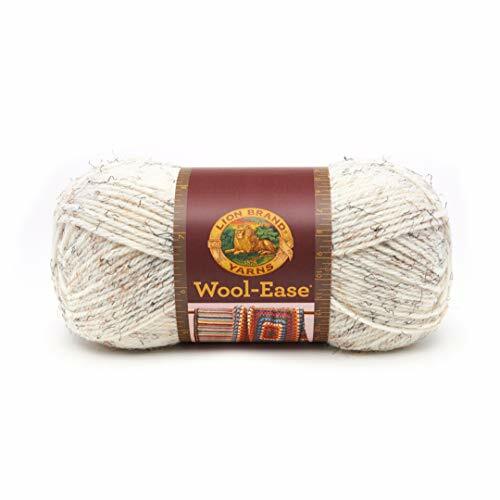 I am new to crocheting and I am Allergic to wool. Is there another option I could use? I love your blog! Thank you! Hi Mandy! Basically any thick chunky yarn would work great. I found this Lion Brand Color Clouds Yarn that is 100% Acrylic. You may be able to find it cheaper and in different colors. The link was just so you can see what I was talking about. Thank you so much for responding!! And thank you!!! ? 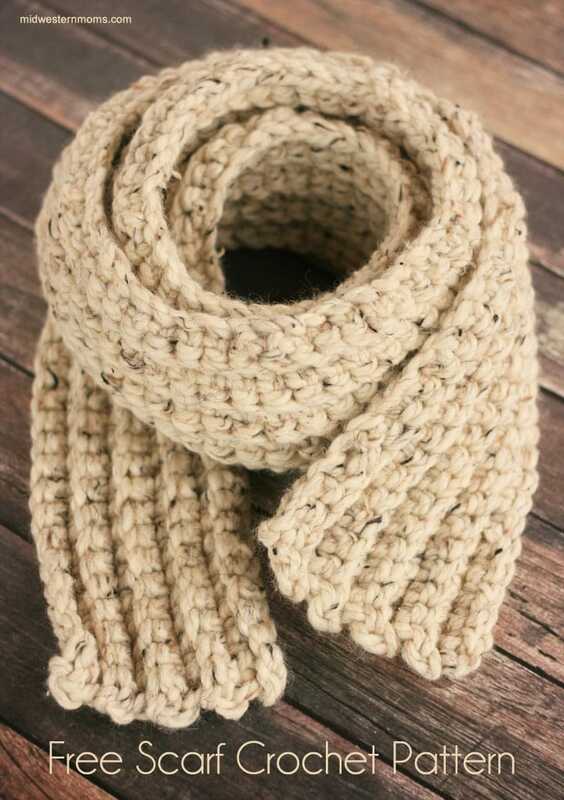 My 9 years old son wants to learn crochet and to make himself a scarf. I think I will use this pattern. Awesome! It is a fairly simple pattern to start with. 🙂 Hope he has fun!